Dead Putting Society is the sixth episode of The Simpsons second season and aired on November 15th, 1990. However, despite it being the sixth episode aired, it was actually written after the following two episodes. I don’t really know why in this particular case, but I assume it might have to do with the broadcasting schedule (since one of the two upcoming episodes is a Thanksgiving episode) and the fact that the actual sixth written episode may have needed some extra time due to some of the visuals shown in that episode (but we’ll get more into that later). The chalkboard gag for this episode is “I am not a 32-year-old woman,” (could have fooled me) and the couch gag features the entire Simpson family sitting down the couch, alongside the family pets Santa’s Little Helper and Snowball II. The story starts with Homer as he struggles to mow the lawn. Frustrated at the situation, he grows even more annoyed when his neighbor, Ned Flanders, starts conversing with him. When Marge reveals that Homer is out of beer, Ned offers a beer to Homer and invites him into his home. While at the Flanders household, Homer gets a close look at how the Flanders family interacts with each other and interprets it as Ned bragging about his family being better than his own. He gets angry with Ned and storms out of the house. That night, feeling bad about the situation that afternoon, Ned writes Homer an apologetic letter and sends it to him. 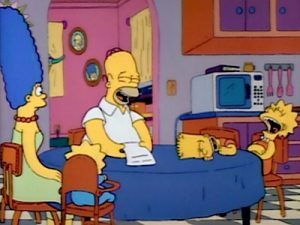 The next day, the entire family listens to Homer as he reads the letter and they all laugh at Ned because of his overly friendly and sappy word usage. This upsets Marge (although she does laugh at the letter as well), and reminds the family that despite Ned’s nature, the Flanders family is still very close and she wishes their own family could have the same closeness. Homer concedes and decides to take Bart to the local miniature golf course. While there, Homer and Bart run into Ned and his son Todd and they decide to play together. At the end of the round, they notice a sign advertising a local mini-golf tournament and Homer declares that Bart will enter the tournament and defeat Todd, while Ned is fairly confident that his son is good and has a good chance to win himself. Homer harshly trains Bart for the tournament because he finally wants to be able to beat Ned at something, but Bart doesn’t adapt to the training very well. Noticing that Bart is frustrated with Homer’s lessons, Lisa decides to help Bart learn the science and geometry behind miniature golf, and as a result, Bart’s game improves tremendously. Meanwhile, Homer and Ned have another exchange and after getting tired of Homer’s taunting, Ned agrees to make a bet with Homer on the tournament; a bet that states the father of the boy who doesn’t win the tournament will have to wear their wife’s best dress and mow the other man’s lawn. The tournament arrives and both Bart and Todd make the finals. In a montage that shows that both boys are incredibly good at this sport, they make it to the final hole of the round with a tie score. Tired of dealing with the pressure of the game and their dads, both Bart and Todd decide to call the game a draw before they finish and they are both proclaimed the winners of the tournament in a wholesome display of good sportsmanship. Homer, still wanting to have the last laugh, approaches Ned and reminds him that since neither boy won, they both have do their side of the bet. Homer is not happy about having to go through with it, but to him, it’s a small price to pay to see Ned humiliate himself. However, he unfortunately finds out that Ned doesn’t hate being in his wife’s dress because it reminds him of his fraternity days, closing the episode on an incredibly humorous and ironic note. As I mentioned before, this is an episode I absolutely love. It was indeed on my Simpsons VHS tape and it was an episode I watched and re-watched many times as a kid. I think the biggest draw of this episode to me was just the fact that I am such a huge fan of golf and miniature golf. Because of this, seeing an episode that was actually about something I loved doing was a big draw for me. I’ve mentioned before in my streams and Let’s Plays that I used to play golf in high school, and to add on to that fact, I also have a yearly tradition with my dad where we both take a day during our annual Florida trips where we go to a couple of the nearby miniature golf courses and play a round or two. 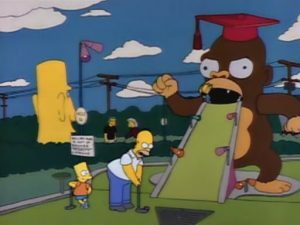 As a kid, I loved the wacky course designs of miniature golf and how there were always these huge, interesting obstacles you had to avoid or pass through, and it was fun to see the Simpsons take on those types of courses. I think even Rugrats on Nickelodeon had an episode like this too that was also fun to watch for the same reasons. So yeah, I always really liked this episode because of that and it was probably my most favorite episode of the ones that were on my VHS tape. As I mentioned in the previous section, I absolutely love the miniature golf stuff and I think it was great how the writers and producers used it in this episode. They made an incredible-looking course, had some good visual and literal gags and just made a great story around the subject to make it engaging and interesting. I think of my favorite gags is when Homer is attempting the “gorilla hole,” and he misses getting the ball into the gorilla’s mouth, causing Homer to swing his arms in anger, very similarly to the gorilla he’s trying to get through. More importantly though, we also get some major insight to the Homer and Ned relationship in this episode. This is the first episode that really tried hard to focus on that, as we’ve only had very brief interactions in past episodes. Literally before this episode, we’ve only seen Homer get jealous of Ned and his possessions, but nothing really beyond that and only for really one scene. Here, the entire episode is about their feud (pretty much) and you really do start to see where there would be problems between the two. For one, Homer has been dealt a pretty rough hand in life. He has to provide for and support 3 kids at a job he doesn’t really like working at, he doesn’t really have a lot of confidence in his own abilities because of that…having pretty regular interactions with a man like Ned could be seen as intimidation, because Ned is so positive about everything and yet still has a lot going for him as well. Because of that, I think the rivalry works really well between the two, and while Homer does take it a bit overboard at times, I wouldn’t necessarily say Ned is 100% innocent either. He’s innocent in the sense that he doesn’t try to provoke Homer, but I do think he could try to take a hint from time to time as well. Another thing I noticed in this watch-through that I never really thought about much before was how every member of the Simpson family had a very noticeable role to fill here (sans Maggie, for obvious reasons). I already mentioned Homer and his feud with Ned, but another thing that is worth mentioning is that Homer’s feud wasn’t just with his neighbor, but also with himself. Although he did come across as being a jerk at times, Homer really just wanted a win for once, and I can’t help but feel that was a very human reaction for him. I think we’ve all been in that situation before where we feel somewhat inferior to the rest of the world, particularly after back-to-back losses, and I feel like Homer’s definitely been fighting that for a very long time. 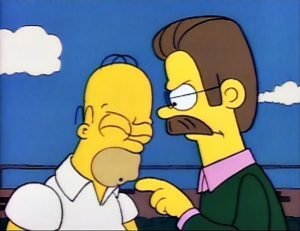 Although his intentions weren’t malicious, I do think Ned came across as being indirectly smug a couple of times, and I think that just hit a nerve with Homer that triggered his emotional side; explaining his particular outbursts. Bart had a very important role as well in that he was the person actually competing in the golf tournament and in sense was also battling his own demons in this episode; the pressure from Homer as well as his overall feelings of mediocrity from having not ever won something. It was really fun to watch him actually improve his mini-golf game and see him actually take Lisa’s lessons to heart. Speaking of which, Lisa’s role in supporting Bart in this episode was also really cool to watch and if anything, showed a dynamic of the Simpson children that you don’t really get too see too often, particularly when it’s not really the main subject of the episode, which I thoroughly enjoyed. And finally, even though she was the least relevant in terms of the plot, even Marge had her moments in the sun as being the voice of reason and almost being a bit of a foil to Homer in some respects. 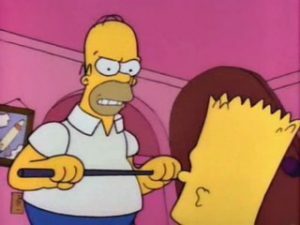 One of my favorite moments in the episode is near the end when Homer is pressuring Bart once again and Marge just gives him a quick slap on the forehead to get him to stop. It’s just a great reaction and even got me to cheer for Marge a little bit as well. 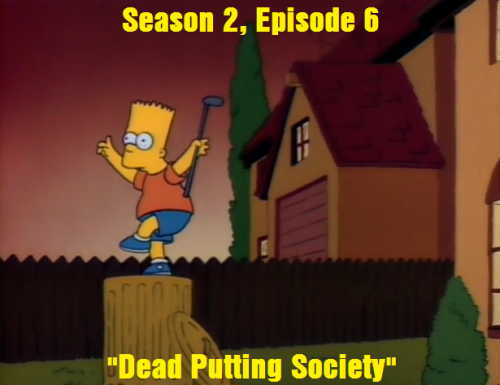 If I had to pick an overall favorite moment of this episode though, and there are a lot of great moments to choose from, I think my favorite moment is when Bart and Homer have the exchange about naming the putter. I just love how serious Homer is taking the situation, but at the same time, how non-serious Bart is about it. The back-and-forth is just really well done and the best part is that it’s not the only piece of it in this episode either. I also just love at the end of the scene when Homer puts up a picture of Todd next to the window, so Bart can stare at him and picture how glorious it will be to beat him, just for Todd to show up a few seconds later, making the same exact pose that he’s making in the photograph. So if I haven’t made it clear, I really love this episode. It’s not just the mini-golf, it’s not just the gags…I just think it’s a very well-written episode, introduces a core aspect of the show in the form of Homer and Ned’s rivalry, and as I discovered this time, was just a clever utilization of the entire Simpson family. The episode could have literally just been about Ned and Homer’s rivalry, but in the second act, it took a small break to give Bart and Lisa some good moments, and I think it made it a very engaging and entertaining watch because of that. I also think the writers and producers made a very good decision in terms of how they concluded the story here. Homer “kind of” got what he wanted at the end, but he was still somewhat punished for his behavior throughout the episode. Like, I sympathize with him wanting a win, but he definitely went the wrong way about it, so karma kind of had it coming for him. It’s also just a funny way to end an episode; by having two grown men mowing each other’s lawns in their wife’s dresses…now THAT’S a comedic and cartoon ending if I’ve ever seen one. I really don’t have much else to say because I feel like I said my piece in the previous paragraph; it’s a good episode. With that being said though, I don’t know if I can call this episode as being the best of the season just yet. For one, we are just a little over 25% done with the season and we have some heavy hitters still to come. Second of all, while it is a good episode, I don’t know if I could call it an amazing episode. It’s fantastic for season 2 standards, but I also know that once the show hits the golden age, we’ll quite literally be striking gold on a pretty regular basis. I’m looking at you Season 5. I definitely don’t mean to be raining on this episode’s parade though; I’ve been looking forward to re-watching this episode again since I started Season 2 for this retrospective and it did NOT disappoint whatsoever. I’m sure there’s quite a bit of nostalgia involved with this enjoyment, for sure, but after the last two episodes, I was admittedly wondering if my opinion would change a little. But after taking a look at this episode again, I can say Dead Putting Society is just a good as I remember it being, and that makes me happy. Well guys, that’s going to do it for episode #6 of Season 2! I’m making some pretty good progress so far, I think. I haven’t missed an update yet, and even though I have been a little late on some of my entries (in terms of when I wanted them up), I’ve still managed to get one review up per week, which was ultimately what I was aiming for. Next week, after taking this weekend to stuff our faces with turkey and other Thanksgiving leftovers, we will be taking a look at the Thanksgiving special for this show; “Bart vs. Thanksgiving!” I’ll see you guys then!